The Wii Gets a Redesign. Wii Kisses GameCube Goodbye. 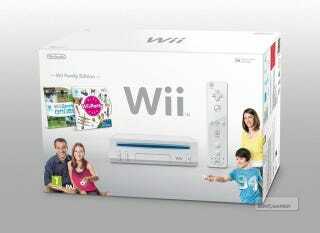 This Christmas, the Nintendo Wii is a getting a slight, wait for it, Wii-design. I mean redesign! According to The Official Nintendo Magazine, the tweaked Wii will be released in the UK this holiday season (no word about a US release). The change is that this Wii is designed to lay flat and has a slightly reconfigured design. The original Wii was supposed to sit vertically. The upcoming Wii U console sits flat, so the tweak could be to bring cohesion between the two machines. Or it could bring confusion. The biggest difference is that this console cannot play GameCube games like the current Nintendo Wii. The redesigned console comes packed with a Wii Remote Plus, a Nunchuk and, according to this photo from Eurogamer, copies of Wii Sports and Wii Party. Expect more details like pricing and non-UK availability.